This portable milliohm meter is a practical digital instrument measuring low resistance, ideal for use in multiple industries workshop, field or test labs in Aerospace, Automotive, n Manufacturing, Military, Utilities - electrical, water and gas. 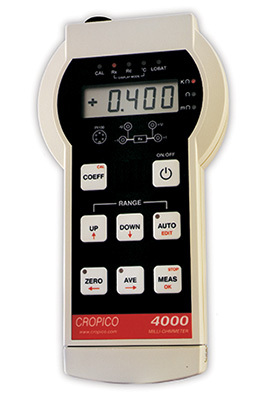 This milliohm meter is of rugged construction contained in a sturdy plastic case with easy to use buttons. The Series 4000 has many advanced features, including auto ranging, forward and reverse current measurement with auto average, true current zero, protection up to 415 volts rms, digital calibration and long scale length, 4000 count and auto power down to maximise battery life. The Series 4000 milliohm meters are supplied ready for immediate use with batteries and measuring leads, no extras are normally necessary. Removable pack with 5 1.5V non-rechargeable batteries. This portable digital ohmmeter is a practical instrument for low resistance measurement, ideal for use in the workshop, field or test facilities. It is of rugged construction contained in an aluminium case with tilt handle. The DO4A has many advanced features, including protection up to 415 volts rms, digital calibration and long scale length, 4,000 count. The rechargeable sealed lead acid battery means real portability with more than 14 hours continuous operation, without the problems normally associated with other battery types. Full measurement capability is maintained whilst charging. The DO7 digital micro ohmmeter is a practical instrument for low resistance measurement, ideal for utilities use in the workshop, field or test facilities. It is of rugged construction, contained in a sealed ABS plastic case with lid and carrying handle. 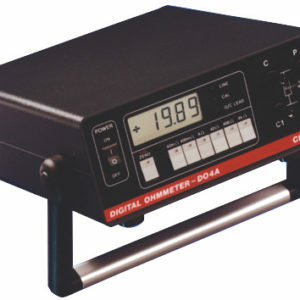 The DO7 digital micro ohmmeter has many advanced features. Rechargeable batteries means real portability with more than 1 hour of continuous operation on the lowest ranges(10A), and 20 hours on all others. The internal charger will boost charge to 90% of full charge, switching automatically to a trickle maintenance charge. Warning LEDs illuminate when an open circuit lead condition is detected. The DO7Plus is a 10A Micro ohmmeter, suitable for applications within Aerospace, Utilities, Cable or Machine Manufacturers or where a cooling curve is required to plot peak resistance. This Micro Ohmmeter comes with built in rechargeable batteries which will provide up to 1 hour of continuous use at 10A, and up to 20 hours at all other ranges. The data log memory using the latest FRAM technology which offers unlimited read/write cycles and over 10 years of data retention, without relying on internal batteries. Ruggedly constructed case IP 67 when lid is closed a d IP53 when lid is open. The MMR-630 Series meters are professional portable instruments for measuring very low resistances. Due to their special measurement algorithm they can be used for both resistive and inductive type of a specimen that makes. MMR-630 series perfect instruments for electricians testing electrical junctions, motors and power transformers windings. The results can be stored in the internal memory and send to a computer via serial interface. A quick PASS/FAIL test function with results displayed and acoustically indicated simplifies measurements considerably.